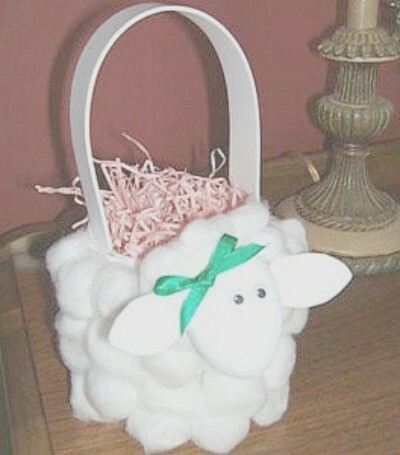 Make this sweet wooly lamb Easter basket with simple to find supplies; some you may already have at home. This is a guide about cotton ball lamb Easter basket. Recycle an empty box or plastic container to create this little lamb basket. Paint Styrofoam or papier mache egg white for lamb's head and allow to dry. Cut two ears from craft foam. Make a small slit in each side of the lamb's head. Put a little glue on each ear and push into the slits. Tear apart cotton balls and glue to top and back of head. Glue on wiggly eyes. Tie ribbon into a small bow and glue to side of head as shown. Glue cotton balls all around container to completely cover it. Glue egg close to top of container for the head. Cut a one-inch wide strip from the foam for the handle. Glue ends to the sides of the container. Ohh cute!! I love it! The ideas just get cuter and cuter!